Jessica Northey-Shaw is kind of a big deal in the country music scene. She’s worked with many of the industry’s top artists, and her #CMChat is probably the largest chat on Twitter, she’s had artists such as The Oak Ridge Boys, Charlie Daniels, Clint Black and Alabama as guests. She told me once that one of the first pieces of advice that Taylor Swift got when she started her career was “Shake half a million hands to get a Gold record”. The message was that Taylor was going to have to connect individually with her fans if she wanted to be successful. Taylor took that advice to heart and has always embraced her fans. In 2010 Taylor Swift agreed to have a free autograph signing for her fans as part of a CMA event in Nashville. Taylor was scheduled to start signing at 8am, and she agreed to sign for a staggering 13 hours. Instead, she signed for 15 hours. The only breaks she took during the marathon signing session was to stop signing long enough to perform music for the over 2,000 fans who stood in line for her autograph. Content creators of all stripes, whether it be a blogger, a Twitch streamer, a YouTuber or a budding Instagram star, want to grow their followings. Most of them are in a race to grow as quickly as possible. Growth is equal to success in their minds, and fast growth equals fast success. Yet when you look at how most rock stars become successful, the ‘growth’ process typically takes years. There are rarely overnight success stories. A big part of the reason why is rooted in how rock stars create and cultivate fans versus how the rest of us do. Consider how the average rock star gets their start. Maybe they perform for a local coffeeshop every Thursday, or maybe a local bar every Saturday night. In either case, the rock star performs for a very small crowd. The crowds are typically small enough that afterward, the singers have a chance to talk individually to the people that took the time to listen to their music. They can connect with these people individually. They can get their feedback, and apply it to the next performance. Connecting individually with these people greatly increases the chance that they will become fans. Which means they will come back next week and when they do, they will likely bring some friends. Those friends will connect with the band after their performance and they will likely become fans as well. As a result, the crowds that the artist performs for each week become a bit larger. Soon, they are too large for the small bar or coffeehouse, and they have to move to a larger club, maybe a local arena. Eventually, as the singers become more popular, they can tour the state, then the region. Then the nation. But the growth, the growth started small by connecting with each of those few fans that showed up the first time to hear them sing. From that point, the growth of the rock stars was fueled by their fans. Of course, you’re going to listen to your best friend. When I say it, it’s advertising, when your best friend says it, it’s a recommendation from a source you trust. Rock stars have always understood this. This is the Loyalty Graph, and it’s one of the most popular features of my book, Think Like a Rock Star: How to Create Social Media and Marketing Strategies That Turn Customers Into Fans. 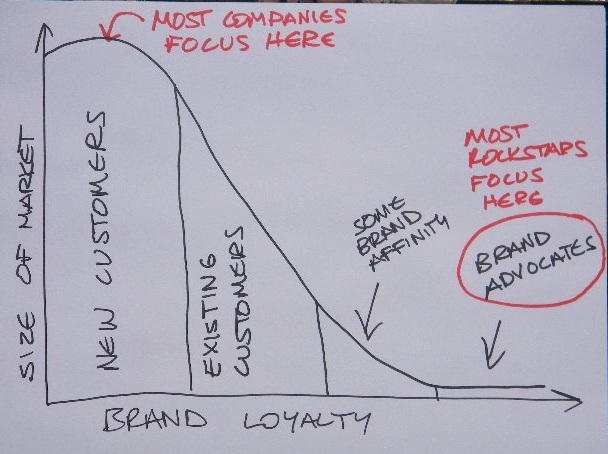 The Loyalty Graph is designed to give you a visual representation of the difference between how most rock stars market themselves, and how most companies do. For the purposes of our discussion, you could consider most companies to be most content creators, and most customers to be readers or followers or viewers. Most rock stars spend almost all of their time interacting and marketing directly with their CURRENT customers, or fans. They do this because they know that their fans will grow their base for them. On the other hand, most companies try to acquire new customers, and all but ignore their current ones. Many bloggers or streamers do the same thing, they create content in a way that will grow their following, but they don’t focus on developing deeper connections with the people that are already consuming their content. Here’s the difference: Go to Twitter right now and tweet a link to your latest blog post and ask your followers to RT it for you. Now email your 5 closest friends and ask them to do the same thing. I suspect you will get more RTs from your 5 closest friends than you ever would from ALL of your followers on Twitter. Why? Because the people following you on Twitter aren’t your friends. They aren’t connected to you and don’t have a relationship with you. Sure, some of your friends are also following you on Twitter, but if you’re like most people, you follow an awful lot of people on Twitter that you NEVER interact with. Case in point: I have about 43,000 followers currently on Twitter. I could grow my Twitter following to 75,000 by the end of the month. How? By simply following 2,000 people every day. About half the people I follow would follow me back, and by the end of the month I’d have 75,000 followers. But how many of those additional 30,000 or so followers would answer my call for a RT? Few, if any. So if I just gained 30,000 followers who I will never interact with and who will never interact with me, what is the point? If you want to grow your online community, do it slow. Connect deeply with every individual person. Let them drive growth for you. The more you do to drive your growth directly, the less influence you will ultimately have over the people that follow you. If you are a blogger and you have 5 readers, you have an incredible power. 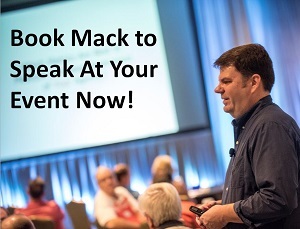 You have the ability to connect directly with EVERY reader of your blog. That’s going to convert them into fans who will grow your readership FOR you. That’s precisely how rock stars grow their fanbases. One fan at a time.